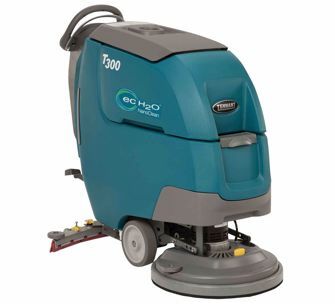 The Tennant T300 scrubber is a compact size machine equipped with Tennants brand new ec-H2O NanoClean™ Technology. This technology converts water into a floor cleaning solution by using electricity which can drastically save you money. The T300 Walk-Behind Scrubber is American-made with the same trusted durability and quality that make Tennant machines industry standard for many applications. It is available in a variety of brush sizes from 17 to 24 inches. Not only are there several different sized brushes, the T300 has the ability to be equipped with 4 different styled brush heads. With such a compact design, Tennant’s T300 can easily fit into tight spaces that much larger cleaning machines cannot. Its Insta-Click™ magnetic head allows a user to change brushes or pads with ease. Its enclosed Hygenic® tanks help inhibit the growth of mold or bacteria. Overall, you cannot go wrong with Tennant’s T300 compact scrubber. It has been designed to save money, improve health and safety by eliminating the need for chemicals which in return is beneficial to our environment.